We don't have set prices as each fireplace is a little different. Things like height, size, amount of creosote debris and other factors can affect the amount of time it takes to clean a chimney. As a result, prices can vary slightly. However, the basic charge for cleaning a standard fireplace is $245 which includes all taxes, labor etc. This includes power brushing the entire flue, smoke chamber and firebox and a visual inspection of the lower flue and smoke chamber. 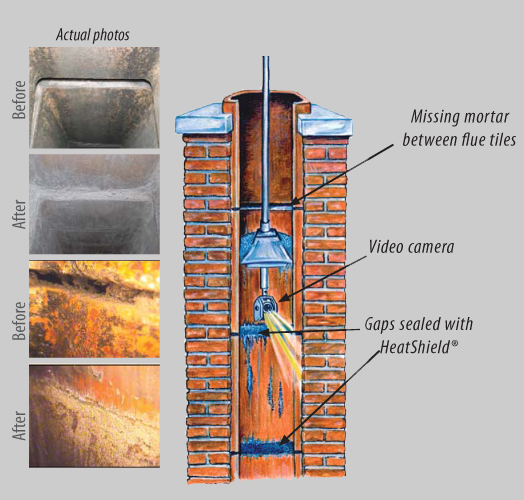 You might be thinking "$225 sounds like a lot" First off you need to understand, no one else does the level of work we do to clean and inspect your chimney for any less. You will find others than clean it for less money but they are not as thorough as we are. They don't take the extra time to make sure it is as clean as it possibly can be like we do. 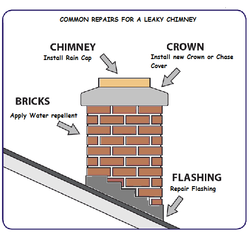 In addition, we are the only service in the area that is CSIA certified (Chimney Safety Institute of America). Your personal safety is at risk. You don't want someone to just quickly run a brush up the flue, collect their money and walk away. We take the job very seriously and do our very best to make sure you receive a cleaning that is better than you expected. Our philosophy is "under promise and over deliver"
Solving Drafting problems can often be a trial and error proposition. we will need to try different thing to see which one gives the best result. 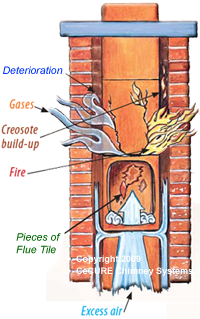 A chimney that does not draft properly will allow smoke to come into the home rather than go up the flue. When this occurs something is causing the air flow to either slow down or reverse direction . 2.Chimney Height The chimney must be tall enough to create sufficient draft and also to clear undesirable air currents traveling across your roof. As a general rule of thumb, your chimney should meet these height requirements. Measure down 2 feet from the top of the flue. From that point measure our 10 feet horizontally. That10 foot radius should clear all roof structures. If the peak of the roof is as tall or taller than the chimney and is within 10 of the chimney it is not going to draft properly. In this case we will need to add an extension to the flue to get the proper height. 3. Cold Chimney- On a cold day the down draft situation can be worse when you first light the fire. T accomplish drat, we need to get the air moving up the chimney. The hot air from the fire attempts to go up naturally. However, until this heat has time to heat of the chimney itself, the hot air from the fire is being cooled off as it goes up and can slow or reverse the air flow. Try starting with a very small fire made from very dry wood. The small fire with dry wood will produce less smoke. Give this small fire some time to heat up the flue before adding larger logs. 4. Fireplace opening is too large An opening that is too large will cause a poor draft situation. There is a formula that we use to determine proper opening dimensions in relation to flue size. In general the flue opening dimensions (length time width) should be no less than 1/tenth the fireplace opening dimensions. For example- if the fireplace opening is 24" x 36" the opening are is 864 square inches. 10% of that is 86.4 square inches. This means the flue dimension must be at least 86.4 square inches. As a result the minimum acceptable flue size would be 9" x 10" or 90 square inches. If your opening is too large for the size of your flue, we can correct the problem by reducing the opening size. We have decorative metal plates that mount either to the top of the opening or the bottom or both. By reducing the opening heath by 4 to 6 inches may be enough to get the opening to the right proportion for the flue you have.